An ominous sign in the Paris catacombs sparked my thoughts about a much brighter future. Five stories below ground level in the 14th arrondissement of Paris lurks an amazing if eerie history. Two thousand years ago quarries here provided limestone to build Lutetia, the Roman village that became Paris. Lengthening quarries later provided blocks to build the Cathedral of Notre Dame, the Louvre palace and the city walls. Just prior to the French Revolution, Paris was menaced by its overcrowded and insalubrious cemeteries. 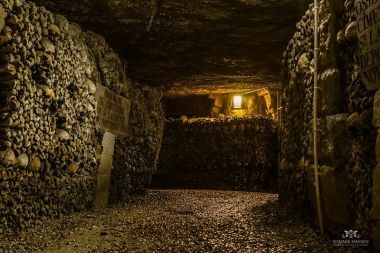 The decision was made to close them and transfer all the remains to a section of the quarries, which became the Paris catacombs. The transfer of the largest cemetery alone took two years. Prominent people rest here, such as the writers Rabelais and La Fontaine. Victims of the guillotine, innocent and otherwise, were brought to the catacombs: the bones of Danton and Robespierre are here too. By the time the final transfer of remains occurred in 1859, between 6 and 7 million had found a final resting place in these tunnels, their bones arranged artistically, in places even whimsically. There is, for example, a large barrel, shaped from skulls and tibias. Like all visitors, I was momentarily stopped by the ominous sign over the gate to the ossuary: Arrête! C’est ici l’empire de la mort (Halt! This is the realm of death). As I walked the half mile of the ossuary corridors, which occupy only a small section of the quarries, I was struck by the sheer numbers of those interred. It is difficult to conjure in one’s mind millions of individuals. How would their lives have been during the Middle Ages, suffering the Black Death, facing barbarian invasions or under the Reign of Terror? So many people, so many personal histories! Then I had a brighter thought: This macabre scene will one day become a place of light and joy. One of the most encouraging lessons of the autumn festivals taught in the Bible is the coming general resurrection of the dead. Jesus promised, “The hour is coming in which all who are in the graves will hear His voice and come forth” (John 5:28-29). Those whose bones lie in the catacombs will live again. The cemeteries of all the world will empty. Even those who have disappeared completely will return. Imagine the amazement of that hour, the jubilation, the embracing and kisses among families reunited, the tears of joy, the rushing return of hope for the future. “I will turn their mourning to joy, will comfort them, and make them rejoice rather than sorrow” (Jeremiah 31:13). “He will swallow up death forever, and the Lord God will wipe away tears from all faces” (Isaiah 25:8). What today is called the realm of death will be forever transformed into the realm of life. Read more about this good news in our free booklet The Last Enemy: What Really Happens After Death?